With Baby K on the way in t-minus two weeks, we've been preparing for all things baby: especially labor and delivery. I've read enough books and had enough conversations to know my options and some of the things that can happen, but there is honestly no way of knowing how the birthing process will go for me. That being said, I know that it will be difficult and challenging, but it will also be pain with a purpose. And in preparation for this purposeful pain, I've created a playlist of some of my very favorite, calming worship songs. The plan is for me to attempt a natural birth (with no epidural), especially because my blood platelet counts are very low, but I am open to doing whatever I need to in order to keep both Baby K and myself safe and healthy. That being said, I realize the need to have a good plan in place to help myself stay calm during what will be the most challenging experience of my life. Music has always been a huge part of my life, especially worship music. It speaks to my soul in a way that most other things can't. I knew that I needed a playlist to help distract me during labor, so I've created the one I'm sharing below. Though it's not long enough to last for the entire delivery process, I know that these are songs full of truth and peace that I won't mind listening to more than once. Click here for the link to open and listen in Spotify! 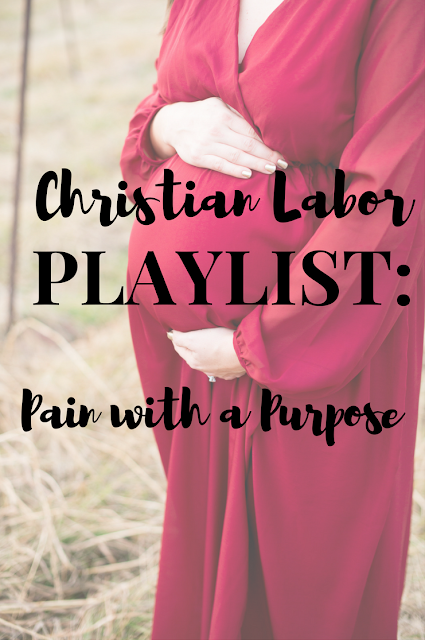 No matter if you're planning a natural birth, planning on an epidural ASAP, or searching for peaceful, worshipful music for a different type of pain that isn't related to childbirth at all, I hope that this playlist provides you with just as much comfort and peace as it does for me. God is good, and I know that he will not leave you or me in the midst of our pain. Our pain is purposeful, even when we don't always see the purpose behind it. In my situation, that purpose is bringing a precious little life into this world, and that is a moment I simply can't wait for. It will be so worth the pain. So excited for you, Kelsie! Keep up the positive attitude. Your'e almost there! You chose so many of my favorite songs, especially the Jeremy Camp one. I didn't create a pregnancy playlist, but I've always loved the idea. Thank Abby! I loved listening to it! Thank you! Did you have them yet? What a great playlist! I will definitely be listening to this this weekend! I am excited for you and your new addition. I'll be praying for a smooth delivery. Thank Elizabeth~ I loved listening to it! Listening now - phenomenal picks, Kelsie!